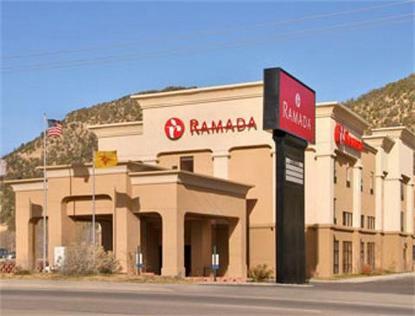 The Ramada Ruidoso hotel welcomes travelers to the Ruidoso high country of New Mexico. Our location in Ruidoso Downs is just a half mile from the Ruidoso Downs Race Track and the Billy the Kid Casino. Just down the road is the Hubbard Museum of the American Horse, and 16 miles north of the hotel is Ski Apache. Our hotel is surrounded by restaurants and unique shops which capture the spirit of both Old New Mexico, and the culture of the nearby Mescalero Apache Nation. At 6,900 feet our summers are warm, not hot, and winters are snowy, but very temperate. Guests at the Ramada Ruidoso find that our hotel makes an excellent base for exploring the historic town of Lincoln, famous for the exploits of Billy the Kid, and where the Old West is still very much alive. The quaint village of Cloudcroft is not far and it is an easy drive to the UFO capital of the southwest, Roswell. The Ramada Ruidoso is a recently constructed, three-story, interior corridor hotel featuring a beautiful lobby area with fireplace, indoor heated pool and spa, exercise room, 24 hour business center, elevators, and uniquely furnished and decorated rooms. All rooms have microwave and refrigerator, Cable TV with 3 HBO channels, Free Wireless High Speed Internet Access, work desk and chair, and Ramada Signature Showers with the Moen Revolution Showerhead. All guests enjoy a complimentary continental breakfast with their free copy of USA Today. For something special, try one of our Jacuzzi tub suites. Come and see why visitors to Ruidoso, Ruidoso Downs and the surrounding area choose the Ramada Ruidoso.